Welcome to the BPF Chicago Chapter Website! For all the latest activities and last-minute changes, please join our Yahoo Group. You can remain anonymous and do not need to have a Yahoo email account, to join. Buddhism's Three Treasures — Buddha, Dharma, Sangha — mirror three principles emerging from the Western enlightenment tradition—Liberty, Equality, Fraternity (or Community). We locate the Three Treasures in our life and practice, folding in the radical communitarian practices of Martin Luther King's "Beloved Community," and Dr. B.R. Ambedkar's radical Buddhism in modern India. Since these Three Treasures and principles are circular and all inclusive, we circle back to the world we live in here and now. 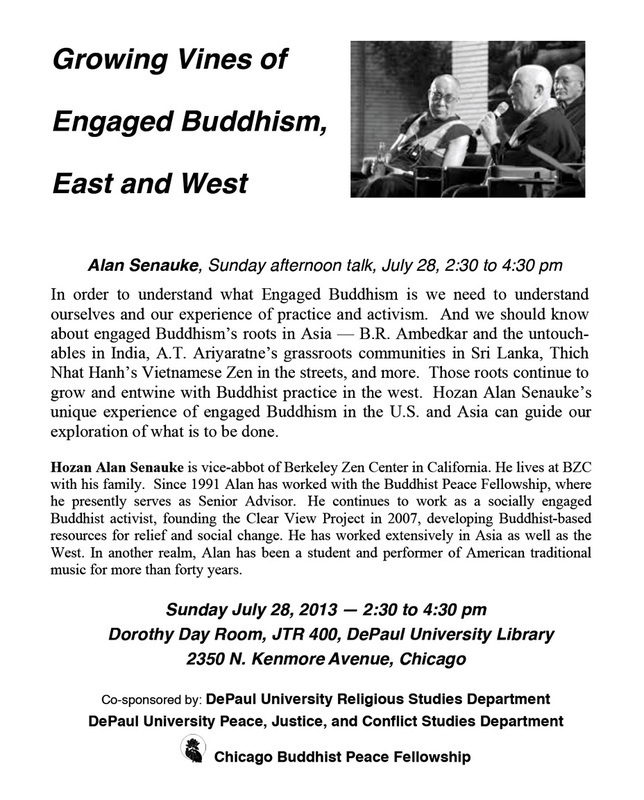 Alan Senauke is a Zen priest and vice-abbot of Berkeley Zen Center in California. As a Buddhist activist Alan works closely with the International Network of Engaged Buddhists and Buddhist Peace Fellowship. He is on the core faculty of Upaya Zen Center’s chaplain training program. 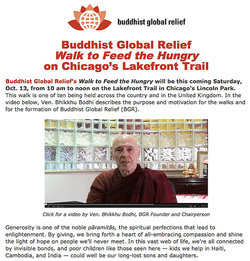 In 2007 he founded Clear View Project, developing Buddhist-based resources for social change in Asia and the U.S. Alan has served as president of the Soto Zen Buddhist Association, a U.S. body of Soto Zen priests. In other lives Alan is a father, a musician, and writer. Wars that never end. Vicious political rhetoric. Congress stalemated on gun control and immigration reform. Persistent poverty in the midst of plenty. Visible signs of climate change. Trying to be a responsible citizen in difficult times can lead to an emotional roller coaster. Anger, frustration and burnout follow all too quickly. However, there are spiritual practices that can help us to ride the waves and stay focused and active. In this hands-on workshop we will explore our spiritual and psychological strengths and offer concrete way to navigate through dark times. Dharma talk entitled "The New Bodhisattva Path." How might we understand the bodhisattva path today? What is distinctive about it? What can it contribute to our work for social justice and ecological healing? 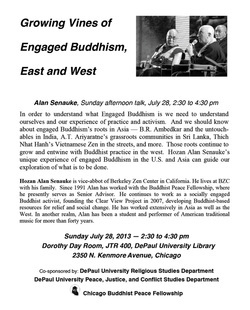 DePaul Event: "Why Buddhism and the Modern World Need Each Other"
Plaza of the Americas, Hubbard St (just north of the Wrigley Building). Raise your voice to stop the genocide of the Rohingya, a Muslim minority, now occurring in Burma (Myanmar). (If you bring any signs or posters, please be mindful about wording (since Burmese "Buddhists" and military are committing the genocide). We will not be bringing the BPF banner, etc. This is about showing solidarity with the local Rohingya refugee community and the Rohingya Culture Center. If you need good background info, watch this: <https://www.democracynow.org/shows/2017/9/20>, click on the Rohingya story. Thank you and we hope to see you there. Please join us on Saturday January 21st 2017, in downtown Chicago, for the Women's March on Chicago, which is being held in solidarity with the Washington, D.C. march. Some members will be carrying our BPF Chicago banner, in the march. Expecting chilly or rainy weather, we will be initially gathering nearby at 9:30am, in the Barnes and Noble (DePaul University) Bookstore at State and Jackson. An email with added info will be sent out to the Yahoo Group, a few days before the event. Thanks, and we hope to see you there! Saturday, November 5, 2016 2-4 p.m.
Ruth Ozeki will read from her novel “A Tale for the Time Being” and talk about some of the ideas that inspired it such as ghosts and history, the perplexing nature of time, Zen and writing, metafiction, self-narratives, and the relationship between readers and writers. Ruth Ozeki is a novelist, filmmaker and Zen Buddhist priest. Her award-winning novels include “My Year of Meats,” “The Face: A Time Code” and “A Tale for the Time Being,” which brilliantly weaves together Zen insights into Japanese culture, temporality, and war and peace in a fascinating story. She resides in British Columbia and Brooklyn, and teaches at Smith College. Her critically acclaimed independent films have been screened at Sundance and on PBS. Join Climate Reality Project Leader and Chicago 350 Chapter founder, Melissa Brice, for a presentation about the science behind climate change and how this affects Chicago. She will offer solutions to climate change, diving deeper into renewable energy, energy efficiency, and fossil fuel divestment. She will share ways to implement change from an individual level to the collective level right here in Chicago. Climate change is a teacher: in this moment it teaches that everything we do has repercussions, that everything is connected, that everything changes and that change must be met with change. This talk reflects on how climate change has been recognized and what possibilities as well as dangers it has opened up in the transformative last decade. How the ways climate is thought about fit into some of the larger transformations of environmental consciousness and perception in the past decades. Rebecca Solnit, a San Francisco writer, historian, and activist, is the author of 17 books about geography, community, art, politics, hope, and feminism, and practices at San Francisco Zen Center. Her brilliant books include Wanderlust: A History of Walking; The Faraway Nearby; A Paradise Built in Hell; A Field Guide to Getting Lost; and Men Explain Things to Me. Climate change; endless wars, growing social inequality; mass incarceration; student debt; deterioration of public school systems; polarized politics. The list of major issues confronting this generation of Americans is very long and change comes slowly or not at all. Using a workshop format, "Becoming Resilient: Buddhist Meditation in Action" offers concrete resources for activists in dealing with frustration and a sense of hopelessness. Dharma teachers Taigen Dan Leighton and Jack Lawlor will show how Buddhist meditation techniques and practices can help us to stay sane and hopeful. Free; light refreshments will be served. 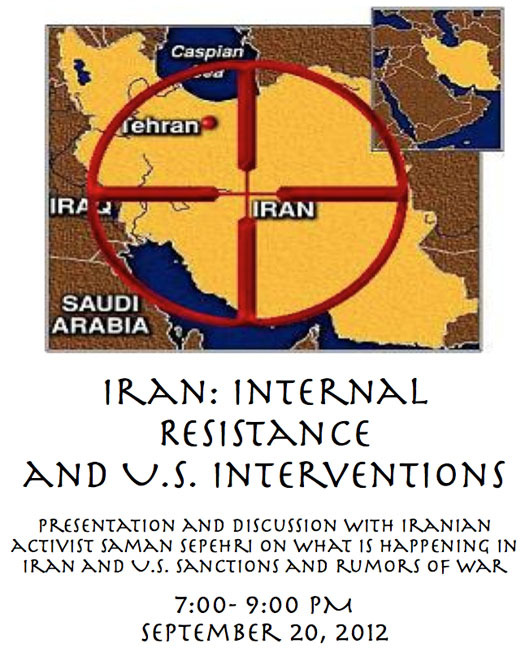 Sponsored by CIE and primarily for DePaul activist students. In cultivating compassion for all sentient beings during a tumultuous time of human-caused suffering, it can be a challenge for Buddhist practitioners to contain the feelings of loss associated with the climate crisis in particular, and the world situation more generally. We will explore some effective strategies for bringing these difficult emotions into our dharma practice, and processing them in ways that lead to right action rather than despair and spiritual bypassing. Zhiwa Woodbury is a long-time eco-activist, wildlife advocate, dharma practitioner, and hospice caregiver. He recently became an Eco-psychologist while offering service at Zen Hospice in San Francisco, and is in the process of writing a book tentatively entitled Planetary Hospice: Responding Compassionately to Our Climate in Crisis. Can spiritual practice be useful to political problem solving? Our political systems, in America and many other countries, are grid-locked and dysfunctional, unable to respond to real threats to our world. Part of the problem is that we forget that there are multiple ways of regarding reality. The two most dominant may be called the Comparative and the Wholistic. Both sides are necessary to our true well-being. But alone, each is half-wrong. True Wisdom is the interaction of the two world-views. The work of balancing these aspects of reality is the legacy of many spiritual traditions. Peter Coyote will present clear examples of how this balance can be helpful and healing to specific current world problems. PETER COYOTE is an actor and activist. He is also a Buddhist practitioner for 40 years, and was ordained as a Zen priest in 2011. See you at these great events! This book traces the worsening developments at Fukushima Daiichi during the first year following the nuclear disaster. 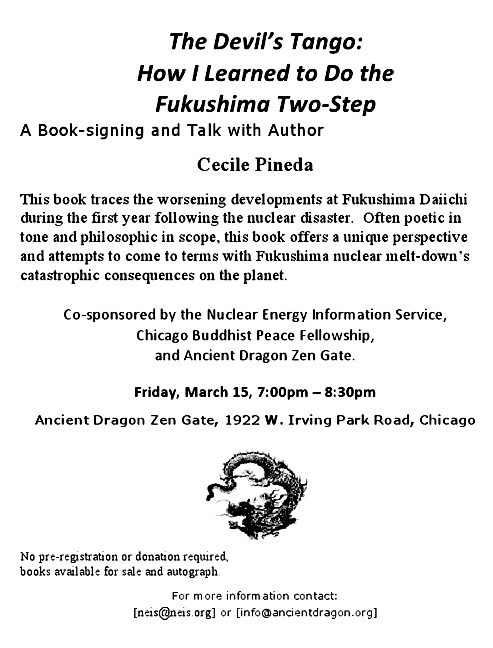 Often poetic in tone and philosophic in scope, this book offers a unique perspective and attempts to come to terms with Fukushima nuclear melt-down’s catastrophic consequences on the planet. 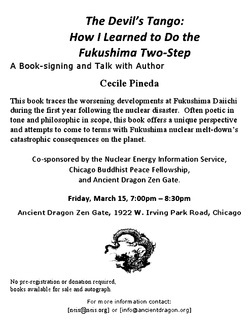 Also co-sponsored by the Nuclear Energy Information Service, and Ancient Dragon Zen Gate. 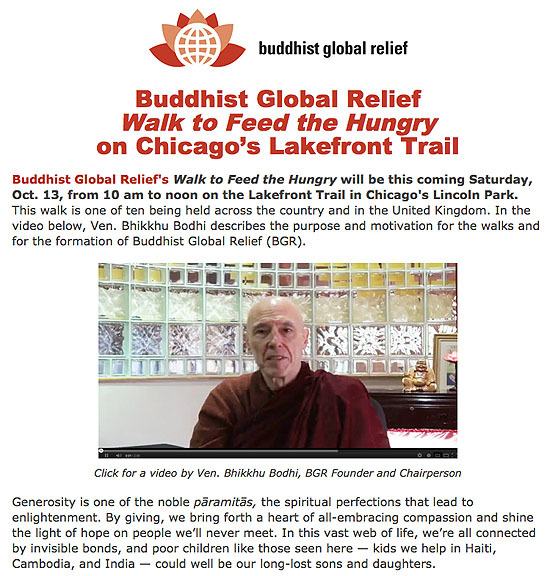 Buddhist Global Relief's Walk to Feed the Hungry will be this coming Saturday, Oct. 13, from 10 am to noon on the Lakefront Trail in Chicago's Lincoln Park. This walk is one of ten being held across the country and in the United Kingdom. 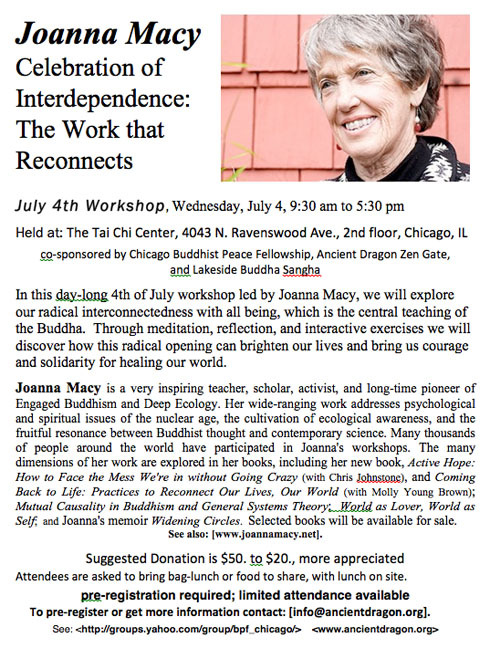 "Celebration of Interdependence: The Work that Reconnects"
The Workshop is Wednesday July 4th, 9:30 am to 5:30 pm, at the Tai Chi Center, 4043 N. Ravenswood Ave., 2nd floor. Joanna Macy is a very inspiring, world-renowned teacher, scholar, activist, and long-time pioneer of Engaged Buddhism and Deep Ecology. In this workshop led by Joanna Macy, we will explore our radical interconnectedness with all being, which is the central teaching of the Buddha, and discover how this radical opening can brighten our lives and bring us courage and solidarity for healing our world. The workshop is co-sponsored by Chicago Buddhist Peace Fellowship, Ancient Dragon Zen Gate, and the Lakeside Buddha Sangha. 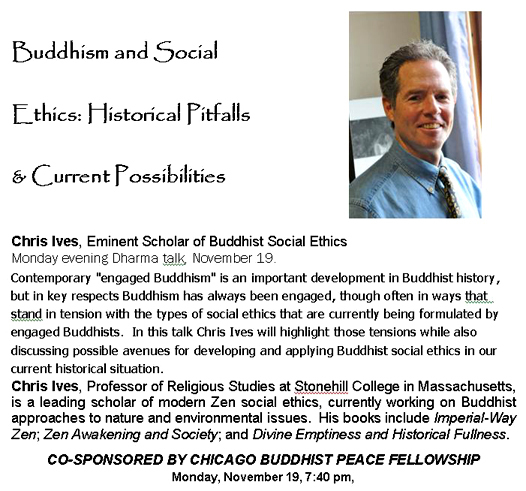 In the midst of challenging economic and environmental issues, and important election year debates, come join us in discovering what the Buddhist tradition and its practitioners can offer American political discourse, policy, and social cohesion. 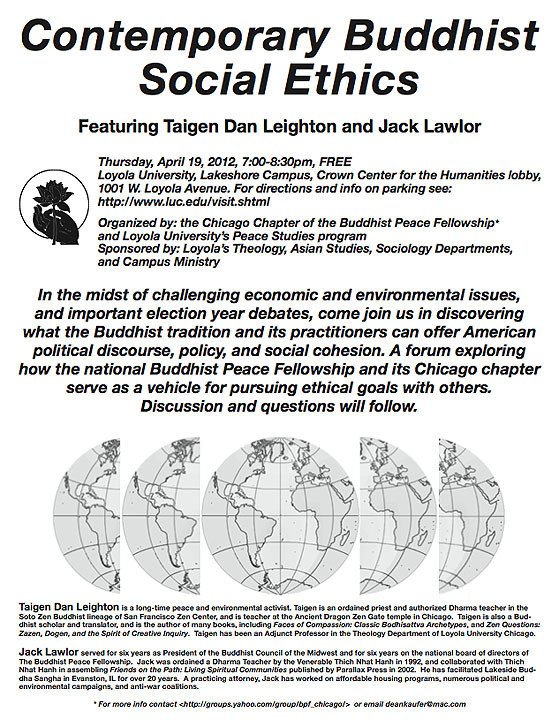 A forum exploring how the national Buddhist Peace Fellowship and its Chicago chapter serve as a vehicle for pursuing ethical goals with others. Discussion and questions will follow.